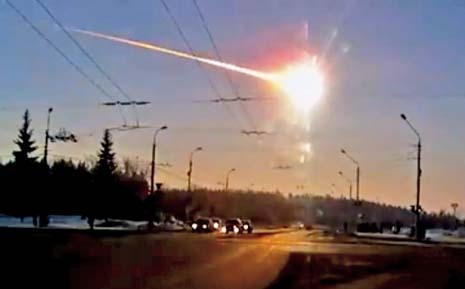 Russian Fireball - Fallout from Chebarkul Meteorite Continues - Sennaya! Vapor trails from Russian meteorite. Was it an attack from America? The return of Optimus Prime? Social media abounds with theories! On February 15, 2013, the sky directly over Chelyabinsk, Russia witnessed a fireball streaming across the sky with multiple cloud trails as fragments broke loose. Citizens witnessed blindingly bright lights as it exploed in the sky. Scientists call this a 100-year event to witness a large meteorite sevent like this. But what made the show more ominous was the series of intensive sonic shock waves that broke thousands of windows. Flying glass sent more than 1500 people to area hospitals. Miraculously, no one died in the incident. 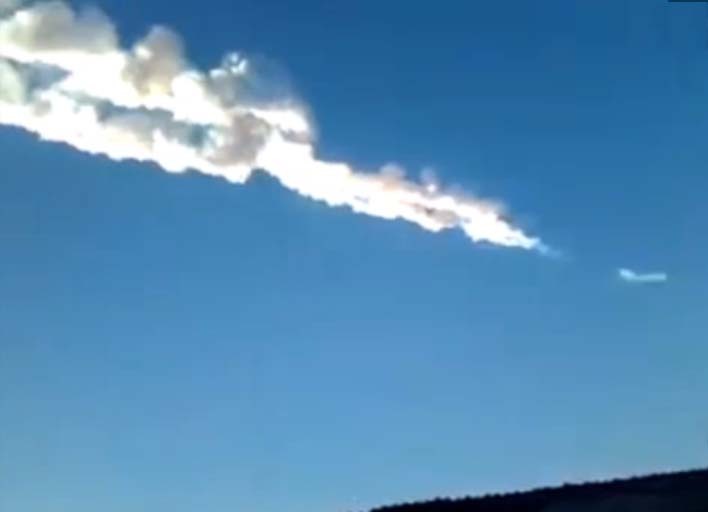 The Internet lit up with searches and posts on the Russian meteorite. YouTube videos instantly went viral and news agencies joined the frenzy seeking footage to share with their audiences. 4,500 buildings were damaged, mostly with broken windows. 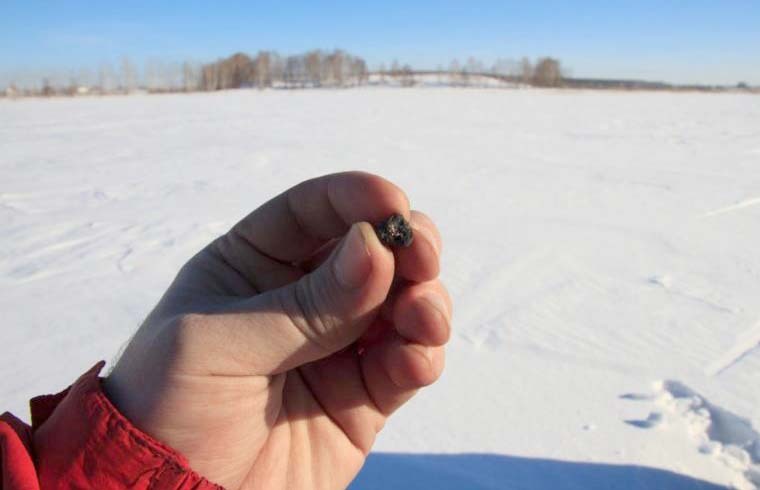 Urals Fedreral University scientists identified 53 fragments of the meteor on the frozen surface of Lake Chebarkul and are searching for a larger fragment under water. The original meteorite is believed to have been 55-feet across and compsed of rock and 10% metal. It will be known as the “Chebarkul meteorite” after the lake where many fragments have been found. The U.S. space agency, NASA, reported the meteor released nearly 500 kilotons of energy, about 33 times more than the nuclear bomb the United States dropped on Hiroshima, Japan, in 1945. NASA said it was the largest incident since 1908, when a meteor exploded over Tunguska in remote Siberia, destroying 80 million trees over an area of 820 square miles. Immediately after the fireball specualtion arose about the origin of the fireball and why it occured. Rumors, perhaps taken seriously by a guillible few, thought the meteor was an attack from the United States that failed to kill anyone. A testament to Russian toughness. Legitimate photos like this RT Science photo of a meteorite sample at Lake Chebarkul is used on eBay to sell ‘meteorites’ of dubious origin. Wanna buy a rock? Almost as fast as the firebsll, fragments of the meteorite were offered for sale in Russia and abroad. Russian police are monitoring online auction sites and social media for false meteorites offeered for sale. RT television reported samples offered for sale for $4,000 each. A week later there are dozens of Chelyabinsk meteorites on eBay.com for sale eBay listings for Russian meteorite, fake? No doubt, some of these are stones from Chelyabinsk and Lake Chebarkul, and some of them are real. However, Russian police reportedly have identified over 1,000 false Chelyabinsk meteorites offered for sale, so buyer beware! Twitter quickly trended #russianmeteor with newsworthy and clever tweets, more than 115,000 tweets in the first hour. First the meteorite exploded, then social media exploded. From Rick Malambri: “Breaking news: Baby found in the middle of the Meteorite crash site, he is miraculously unharmed. Wrapped in what seems to be a red cape. Sports Comedy: Scientists say that ‘meteor’ this morning was just a Dwight Howard free throw from last night. 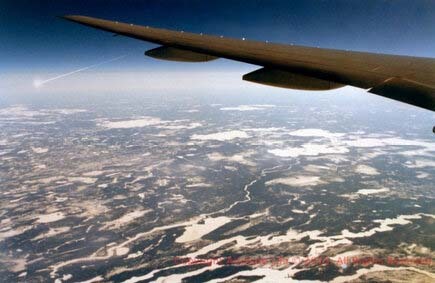 Russian meteorite seen from an airline. Ash Ketchum: What if the #russianmeteor is a fossilized Pokemon from space? Hal 9000: The only way the #russianmeteor could have got more YouTube views is if it had been a spaceship piloted by cats. Thoughts, news and analysis from an American point of view on things Russian.